Resin-filled ocotillo can flame with fire and with red flowers. ﻿﻿﻿﻿﻿﻿﻿﻿Whenever I head out to West Texas, I always marvel when I spot my first ocotillo along the highway. There it is, in all its spindly glory. If we’ve been blessed with rain, tiny green leaves will have sprouted along the prickly stems. And if we are really lucky, we’ll catch splendiferous red flowers sprouting from the tips of the branches against the backdrop of the open sky. That a plant as strange looking as ocotillo can exist on this planet is testament to the wonder of desert survival and adaptation and, just maybe, a wink and a nod from Mother Nature. The ocotillos (Fouquieria splendens) we know from our Southwest deserts form the northernmost range of a single species of a uniquely Mexican plant family, the Fouquieriaceae. Eleven ocotillo species, all native to Mexico, make up not only the genus, but the entire family. In Mexico, there’s remarkable variation in growth form, from cane-like shrubs to umbrella-like trees to monster bottle trees. Ocotillo, an indicator plant of the Chihuahuan Desert, grows on slopes at low elevations from California to the Pecos River. Left undisturbed, ocotillos typically live 60–100 years (even up to 200 years). Great places in Texas to see stands of large ocotillos are Lake Amistad National Recreation Area, Big Bend Ranch State Park, Big Bend National Park, Devils River State Natural Area and Guadalupe Mountains National Park. 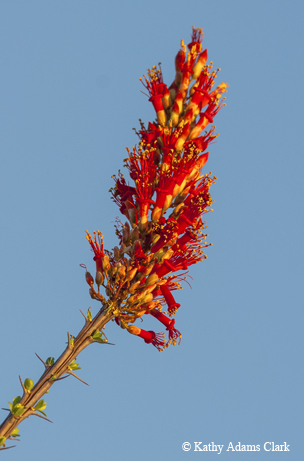 In the springtime, ocotillo produces its red, tubular, nectar-filled flowers that attract bees, bats and migrating hummingbirds heading north to their summering places. Matt Turner, in Remarkable Plants of Texas, explains that ocotillo, although dry and dead-looking most of the year, actually has the ability to produce leaves upon demand when it rains. During the summer monsoon rainy season, the tips of the stems will sprout one kind of leaf that will harden into the spine that protects the plant. Then, when it rains outside of the rainy season, the plant can break dormancy, sprouting a second set of leaves along the stem that last but a few weeks. These leaves can appear within 24–48 hours after a rain and are considered reliable indicators of recent rains. Desert people have used ocotillo for centuries. Even today, the old-time tradition of using ocotillo wood to make a fence is hard to improve upon. Delena Tull, in Edible and Useful Plants of Texas and the Southwest, tells us that the sweet flowers are edible and can be made into a drink when soaked in water. Traditional native people ground the seeds into flour. To protect the plant from the sun, the stems produce resin, wax and gum. The wax has been used for waxing leather, the gum as a thickener and adhesive, and the resin as a waterproofing agent and varnish.